Ahh Good Hemp Oil, our oldest and dearest child. 20 years ago we set out on a mission to make hemp a kitchen staple around the world, armed with our first omega-rich culinary oil, and people loved it. They drizzled it on salads, made roast potatoes and even poured us over ice cream (that was Jamie Oliver and I think he’s the only person that ever done that…but we’ll take it). Today, despite having a whole range of products, we’ll never stop talking about the benefits of our oil (or hemp in general). And while we have no favourites (parents never do) Good Hemp Oil will always have a special place in our hearts. We make our Good Hemp Oil by cold-pressing hemp seeds which helps maintain that light and nutty taste we’re always talking about with hemp. It’s naturally packed with omega 3, which are essential fatty acids that experts believe aid good brain and heart health as well as boosting circulation and the immune system. 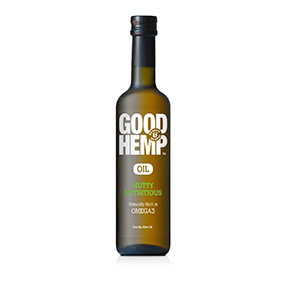 Oh and we think it’s way better than its cousin olive oil, because hemp oil has 25x more omega-3 and 40% less saturated fats. Anything olive oil can do, we can do better. 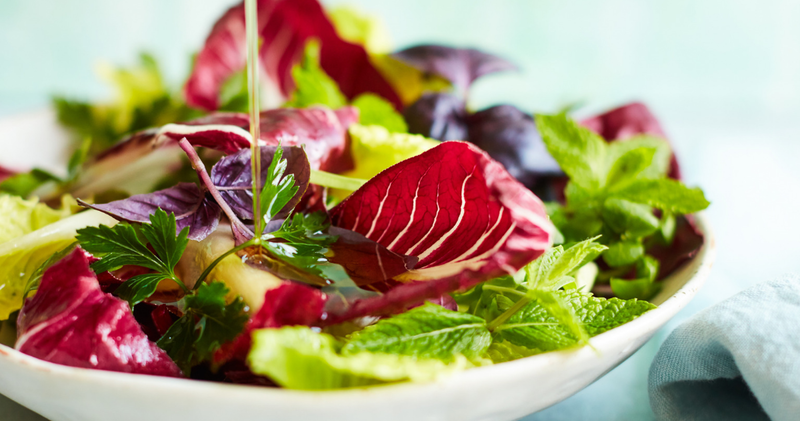 Use hemp oil like you would olive oil, drizzled over crunchy lettuce leaves with a squeeze of lime or whipped into a tasty vinaigrette with balsamic, lemon, salt and pepper. This was how chef Hugh Fearnley– Whittingstall first convinced people that hemp oil was the next big thing. We know everyone has their favourite way of making roast potatoes, so why not make this one yours? 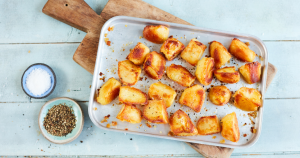 Here’s the hemp oil roast potatoes recipe, take it as your own. Watching the waistline? Good Hemp works great on roasted veg too. 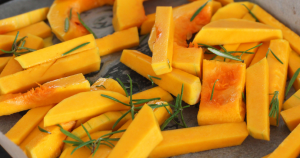 As we’re coming into the colder months, give it a whirl with pumpkin, sweet potato and butternut squash. 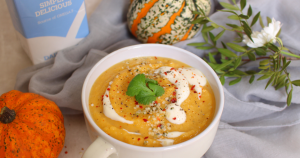 Talking of butternut squash, this dairy-free butternut squash and hemp soup recipe uses a healthy dose of Good Hemp Oil. The butternut squash, rosemary and hemp oil give it allllll the flavour, while the unsweetened hemp milk gives it a creamy, rich texture (without the cream, of course). 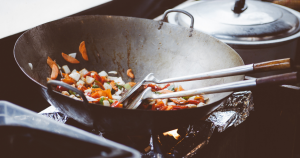 The base to any great stir-fry is a culinary oil, along with garlic, ginger, chilli and soy (or tamari if you’re gluten-free). Cook up whatever veg, combine with your rice noodles, then pour some extra oil on top with a sprinkle of coriander. 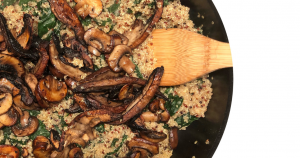 If you’re not feeling stir-fry, try this miso quinoa bowl with mushrooms, cavolo nero and hemp seeds. The oil gives it a rich, nutty taste which complements the miso perfectly. Ok, ok, we know it might take a minute to wrap your head around pesto without olive oil. 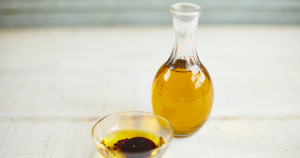 But it might just become your new favourite hemp oil recipe. Plus ours is nut-free. 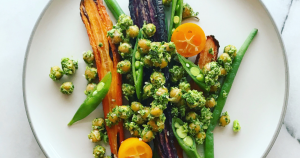 This recipe by Phoebe Liebling uses our Good Hemp Oil with hemp seeds, broccoli florets and a large bunch of parsley. She pours it over root vegetables, delish. 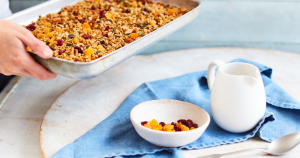 Forget the shop-bought stuff, our Good Hemp homemade granola is as easy as 1,2,3. Combine the oats, nuts, Good Hemp Seed Hearts and cacao nibs into a large bowl. Then mix with Good Hemp Oil, maple syrup, salt and hot water. Spread it all over a baking tray and voilà!